Melodrama, Space Warfare, and Romance, Oh My! Welcome to my first books column for Interstellar Flight Press — a monthly rundown of SFF new release coverage, recommendations, discussions of old favorites, and hopefully author interviews. I want to talk about SPACE OPERA. Like many of you, I imprinted on Star Wars at a young age, and now any story emphasizing space warfare, melodramatic adventure, interplanetary battles, chivalric romance, and risk-taking must be consumed. Immediately. If the SFF books coming out over the next few months are any indication, space opera is having A MOMENT and I’m beyond excited. Considering the new Star Wars trilogy, the popularity of The Expanse TV show and, in the book world, the monumental success of Ann Leckie’s Ancillary series of space opera novels, this makes sense. If you’ve imprinted on Star Wars like me, you’re going to have a happy next few months until you remember you’re still stuck on Earth. Got a hankering for “melodramatic adventure?” Pick up Pure Chocolate (released in March). 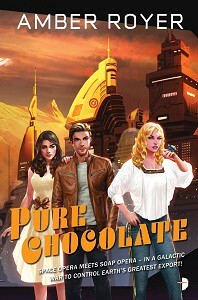 It’s the second book in Amber Royer’s Chocoverse Series; the cover describes the story as “space opera meets soap opera” and the author calls the book a “telenovela.” Chocolate is Earth’s last great export and everyone else in the galaxy is killing to get their hands on it. The heroine is a culinary arts student caught stealing chocolate who has to go on the run. If you’re behind, start with the first book Free Chocolate. Perhaps you need some chivalric romance? Try Polaris Rising by Jessie Mihalik, out in stores now. A space princess flees an arranged marriage and teams up with an outlaw. During their adventures through intergalactic space, they fall for each other. Does this couple sound a little bit Han and Leia-esque? Uh huh. It’s one of my favorite ships, and I can’t wait to read this book. What about characters taking risks in space? 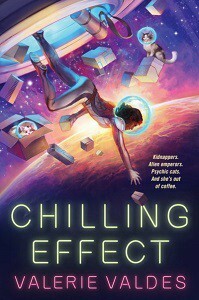 Try Chilling Effect from Valerie Valdes, coming September 2019. According to the author, her heroine makes risky decisions but all in service to save her sister! This book also has adorable space cats. How can you resist the adorable space cats? I don’t think I can. Last but not least, how would you like some good, old-fashioned SPACE WARFARE? (I don’t know why but it just seemed wrong not to put that in caps. It feels like a phrase that should be accompanied by trumpets and fanfare, no?) Here’s where I go off on a slight tangent: where is the line between space opera and military science fiction? Is there one? Should there be one? I personally read both and for me, it’s more of a sliding scale than an either/or situation. I guess if the book is strictly about military personnel with no other space opera trappings (like a galactic empire) then it doesn’t belong under the space opera umbrella. 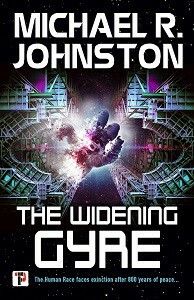 Usually, though, for some books, the needle swings more toward space opera, some more toward military science fiction. OK, tangent over. 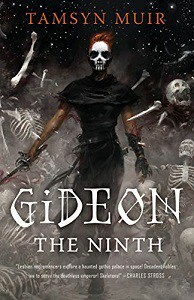 Other Space Warfare books that I’m excited for are the “space caper” Finder, coming in April from Hugo award winner Suzanne Palmer, and the bonkers looking Gideon the Ninth by Tamsyn Muir which smashes fantasy (think swords and necromancy) with sci fi (think spaceships and intergalactic politics). And the cover is FANTASTIC and yes, I do judge a book by its cover. Sorry. Not sorry. Last but not least, the second novel in Gareth L. Powell’s Embers of War series, Fleet of Knives, is out now featuring a former warship helping a mysterious generation ship in deep trouble with some dangerous aliens. That’s what I’m planning to read over the next few months. What new space operas are you looking forward to? And where do you draw the line between space opera and military SF? Like what we do? Become a Patron and help us publish more nerdy news! You too can command the galaxy for just $10/month! Interstellar Flight Press is a new speculative publishing house. We publish essays on science fiction and fantasy, pop culture, and geek fandom.